Norway-based Kongsberg Gruppen and U.S. missile maker Raytheon Company are expected to deploy and integrate their fifth-generation over-the-horizon Naval Strike Missile (NSM) in the U.S. Navy’s fleet of littoral combat ships (LCS) a few months ahead of schedule, defense industry executives revealed earlier this week at the at the Euronaval naval trade show in Paris. The U.S Navy selected the NSM for its LCS force and future frigates, designated FFG(X), in June of this year. The NSM is expected to be installed on the main deck of a LCS in a proprietary canister launcher. Each LCS will be armed with up to eight NSMs. Overall, the U.S. Navy intends to procure 64 NSMs by 2023 with follow-on orders expected. “Raytheon will manufacture and deliver the over-the-horizon weapon systems under a $14.8 million contract for offensive missiles loaded into launching mechanisms, and a single fire-control suite,” a June 1 Raytheon press release stated. The NSM is the successor to Kongsberg’s Penguin short-to-medium range anti-ship guided missile. The missile, featuring an imaging IR-seeker and inertial/GPS navigation, can strike both sea and land targets at a distance of around 185 kilometers (100 nautical miles). Carrying a 125-kilogram (276 pounds) multi-purpose blast/fragmentation warhead, the NSM is capable of reaching high subsonic speeds and can approach its targets in sea skim mode. The missile also reportedly uses a built-in database of representative ship types in order to automatically discriminate between the intended target and other objects. The NSM is the U.S. Navy’s first new anti-ship missile in decades. It selected to the NSM to boost the LCS’ combat power mandated under the “distributed lethality” concept of operations (see: “The US Navy’s New Surface Warfare Strategy: ‘Distributed Lethality’”). The U.S. Navy currently deploys the Boeing RGM-84 Harpoon Block II and the French-designed MBDA Exocet aboard its surface combatants. 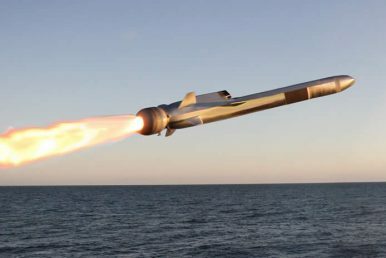 Boeing and Lockheed Martin initially pitched an upgraded variant of the Harpoon and the Long-Range Anti-Ship Missile, but dropped out of the competition for the LCS and future frigate contracts in May 2017. The U.S. Navy christened its latest littoral combat ship, the future USS Kansas City (LCS 22) in September. The service accepted delivery of two Freedom-class LCSs — the future USS Sioux City and USS Wichita — in August. A total of 11 LCSs have been commissioned to date. However, not a single ship of the class has been operationally deployed in 2018.